If you have been working at your current job for a while, you probably have a pulse on what your building or company needs in terms of the people who live, work, or visit each day. Establishing a reliable source of food and beverage options is an important element. That’s where Bernick’s comes in. Our vending machine process is pretty simple, but we take a few steps you might not expect in getting you what you want. Remember, Bernick’s doesn’t sell to you; we partner with you. There is a difference. We meet for the first time to gauge that true fit - which might sound cliché, but in our business, is so true. Together, we want to ensure that we can work toward the same goal: bringing great brands of food and beverage to the consumer. We’ll discuss your company or business as a whole; determine who you wish to serve – your employees, your customers, or both – to determine the amount of volume you will go through. We’ll consider space on site and review any concerns you have with foot traffic, security, and access. Vending machines are emblazoned with bright Pepsi and Aquafina logos for a reason: to attract attention and engage with users. Vending machine placement is a large part of our process. We always ask our vending machine partners what their “wishlist” is for their company or business’s vending options. Knowing what their ultimate goal for vending is, compared to what their volume looks like helps us establish the plan. Candy/snack machines might not make sense for an office of 20 people, while a traditional soda vending machine does. The same goes for the glass front vending machines that can feature other beverages, like Naked juice, Izze natural soda, and Pure Leaf iced tea. Location of the physical building also is taken into consideration when selecting which vending options make sense. If there is a convenience store adjacent, you might not need to carry candy or snacks in your machines. However, if that convenience store is across a busy road, or a few blocks away, offering food options on site might be great. It will decrease the likelihood of your employees leaving grounds to grab something to eat – offering options right where they work, is a great perk not to be overlooked. Once we’ve agreed together to move forward as vending partners, the rest is just details. We introduce you to your account manager, delivery driver, and backup driver – affectionately known as your “Bernick’s Team”. We prep your vending equipment and select an installation/go-live date. And perhaps the most fun detail is product selection. This goes back to the wishlist discussion, except we execute instead of talk big picture. If your vending machines are intended for your employees, you might already have a pulse on the food and beverage options they desire. If the machines are for building residents or customers, people you might not have a direct relationship with, you can count on your account manager to offer suggestions on brands and products that typically are well received in vending machines. We’ll take note of any health initiatives you have (or even wish you had) and make sure we offer plenty of healthier options, too. By partnering with a great vending machine company with an order accuracy of 99.92 percent, you only need to fill out one order form. Neither you nor your employees need to spend time stocking the machine. You receive automatic restocking of your vending machine when it runs low. With nearly 1,000 units picked from the warehouse per hour and over 450 orders serviced per day, we pride ourselves in making sure that you never run out of any individual product. 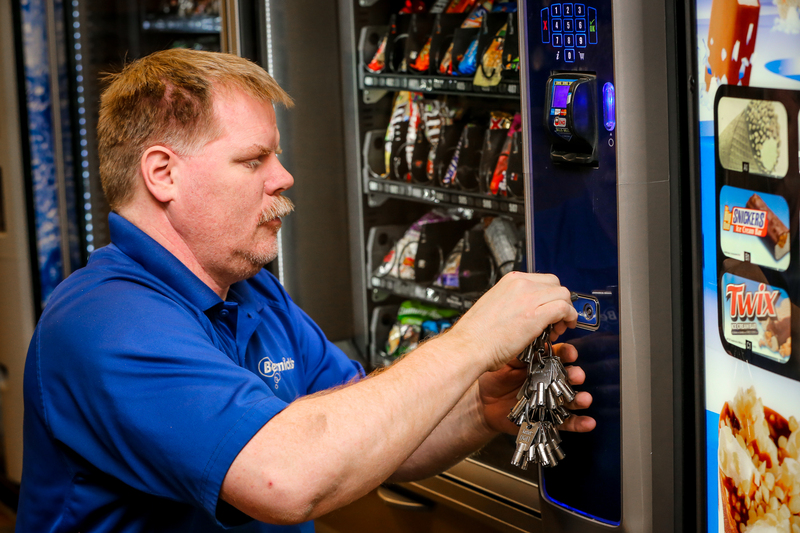 With all employees being cross-trained in all duties to improve efficiency, our vending machine service includes repairs should they malfunction or break down. As a company that provides 638 unique items including batteries, hair products, and coffee, Bernick’s provides expert advice, free of charge, on what vending items are likely to sell best for your business, in your area, during a specific time of year. This increases consumer satisfaction. In simplest terms, this means Bernick's puts you - the customer - first in every way. Bernick's provides unique options for vending and completes all orders as quickly, and accurately, as possible. We pride ourselves on being the innovative service leaders of our industry, and can’t wait to add you to our family of partners.